Our custom logo Burk's Bay Napa driving leather jacket is made from top grain leather. A gorgeous promotional item for long-standing clients and corporate, the Burk's Bay Napa driving leather jacket is made of top grain leather that fits beautifully. 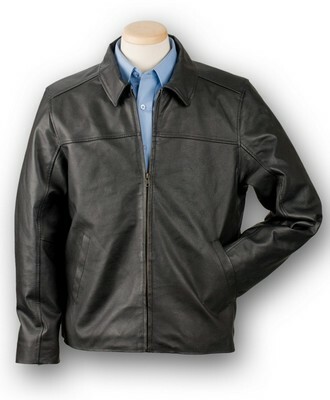 This leather jacket features a heavy duty brass zipper to close and block out the wind. Put your keys in one of the two side entry slash pockets and your phone or tallet in the convenient inside breast pocket. With nylon lining and polyester fiberfill, this driving jacket is a great custom logo item for corporate, raffles and loyal clientele.